Liverpool and Chelsea have been offered a boost in the pursuit of Christian Pulisic with Bayern Munich no longer in the running to sign the Borussia Dortmund attacker. The United States international has only 18 months remaining on his existing deal with the Bundesliga leaders and this has already led to the suggestions that he could be offloaded in either January or at the end of the season. Amidst this, a number of elite teams including Bayern have been linked with the versatile forward but according to The Mirror, the German champions are likely to restrict themselves from making an approach. 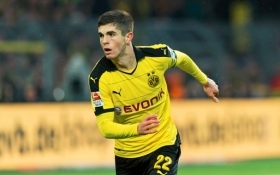 It is added that the Bavarian giants believe Pulisic favours a switch to the Premier League instead while Dortmund are likewise expected to restrict his sale to a direct league competitor. Pulisic has dropped down the pecking order at Dortmund this term with the emergence of Jadon Sancho. He is currently valued at around £70m by Dortmund, who are presently at the top of their league standings.